1. 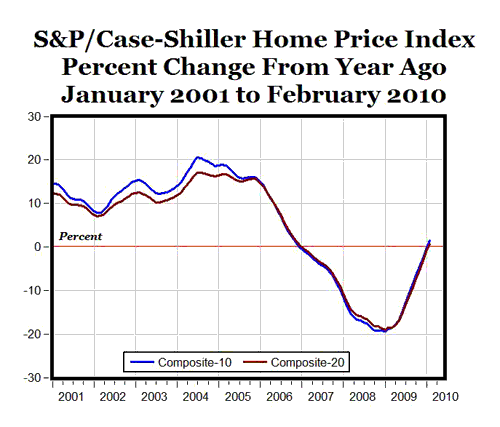 The 10-City Composite Home Price Index has increased nine consecutive months for the first time since the spring of 2006, almost four years ago, and it reached its highest level since December 2008, 14 months ago (see top chart above). 2. Based on the percentage increase from the same month in the previous year, the annual rates of returns for both home price indexes improved in February, marking the 13th consecutive monthly improvement for the Composite-10 Index and the 11th monthly improvement for the Composite-20 Index. For the first time since December 2006, the annual rates of returns are positive for the indexes: 1.48% for the Composite-10 Index compared to last February and 0.70% for the Composite-20. Bottom Line: Nationally, home sales bottomed in January 2009, and have been on an upward trend for the last 14 months. 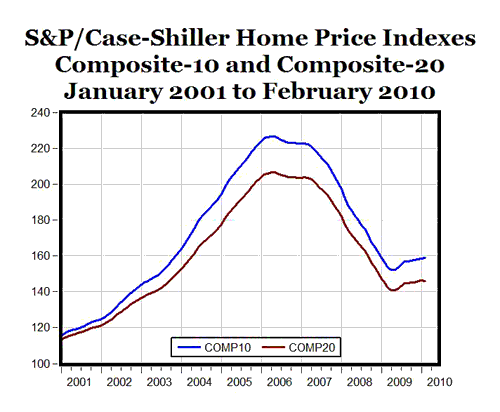 The Case-Shiller Composite Home Price Indexes both reached a bottom in May 2009, and the Composite-10 Index has now increased for nine straight months. Now that there’s a gradual upward trend in both home sales and home prices, it’s a positive sign that we’ve moved past the bottom of the real estate market, and are now moving slowly towards a full recovery. The falling home prices through the middle of 2009 helped to bring buyers back into the market and bring about a better supply/demand balance in the market, as excess inventories have gradually been cleared.